The musical legacy of Antonín Dvořák has always held favor with the public and esteem among musicians. Until recently, however, few in either group – this side of Prague – would have mentioned Dvořák’s opera “Rusalka” with his most important works, much less listed it with the greatest achievements in the operatic canon. But the Lyric Opera’s first-ever production of “Rusalka,” a musical fairy tale of consummate beauty and profound humanity, dictates a rethinking of its composer and acknowledgement of this opera in the first rank of music-dramas. Imagine the finest qualities and most inventive features of Dvořák’s consensus masterpieces – works like the Eighth Symphony, the Cello Concerto and the “Dumky” Piano Trio – distilled into a theater piece buoyed by exquisite writing for the voice, and you have the essence and the allure of “Rusalka.” Put all these attractions on exemplary display and you have the Lyric’s magnificent new production directed by David McVicar and conducted by Andrew Davis, with a stellar cast led by soprano Ana María Martínez’s many-splendored performance in the title role. A hit from the start (1901) in Czechoslovakia, “Rusalka” has gone virtually unnoticed in the West largely because opera companies and singers have historically steered around the Czech repertoire in its original language. (Smetana’s “The Bartered Bride” has generally been sung in German.”) No doubt the increasing frequency of Janáček operas sung in Czech in Western houses has helped to open the way for “Rusalka” – long known only by the radiant “Song to the Moon” from Act 1. But “Rusalka” is awash with arias and ensemble moments no less beautiful, all underpinned by orchestral writing that teems with the richness and vitality of Dvořák’s adored symphonies. 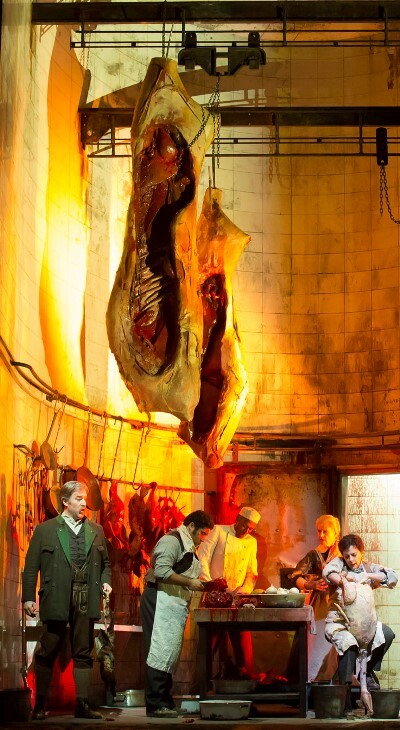 And the story itself, based on a collection of Czech fairy tales, unfolds in an exceptionally cogent and satisfying libretto by Jaroslav Kvapil. The Czech word “rusalka” means a young girl who has committed suicide after being rejected by her lover – much like the Wilis in the ballet “Giselle.” Here, the vengeful apparitions emerge from watery invisibility to lure men to their deaths. But the water nymph Rusalka falls in love with a mortal, a prince, after he swims in her unseen embrace. Appealing to her father the water goblin and the witch Ježibaba, she is granted human form – but without the ability to speak and with the proviso that if she is rejected, she can never rejoin her sisters but must remain apart with her sorrow forever in the depths of the lake. Events do not go well for Rusalka. As a human, she feels alienated, a nymph out of water unable to share the prince’s passion, confused and mute. He finally loses patience, finding comfort with a visitor, a gorgeous foreign princess. When Rusalka slinks back to her pond, the bewitched and desperately miserable prince follows. 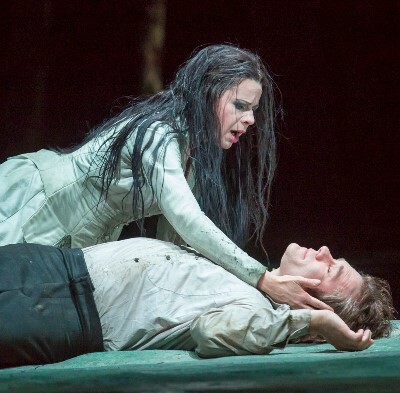 Rusalka cannot bring herself to do what is required to save herself; the prince cannot endure life without her. The story ends in tragic resignation and, with it, a kind of peace. Martínez’s Rusalka, beguiling in more ways than one, is a gentle creature whose silvery voice conveys her innocence in a ravishing “Song to the Moon” and just as affectingly captures the heartbreak and despair of two soaring arias in the final act. 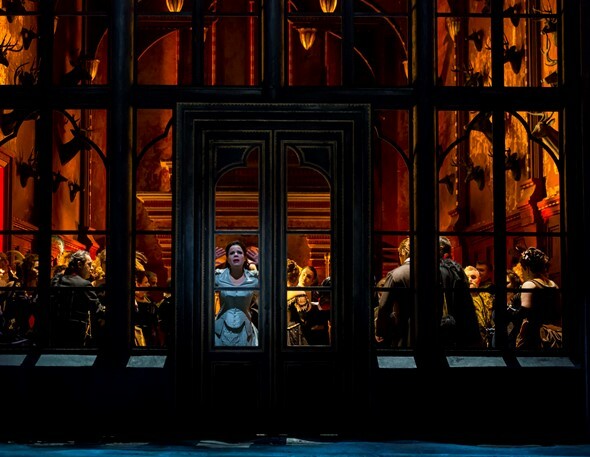 Hardly less compelling is Martínez’s complete silence, at the palace in Act II, as the mute and frightened nymph struggles to understand, to communicate, to keep her lover from abandoning her for another woman. 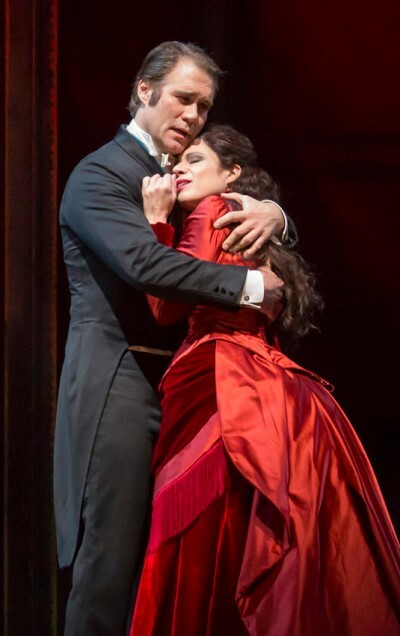 Martínez and tenor Brandon Jovanovich as the prince make a wonderful pair of lovers unable to connect, both smitten in a hopeless mismatch. Jovanovich brings imposing vocal power to bear in the emotional Sturm und Drang of Act II, and singing of sparkling sensitivity to the fateful reunion at the lake. Dvořák provided ample vocal rewards all around, and they pay off generously here, not least in bass-baritone Eric Owens’ water goblin, Rusalka’s father and master of the lake. Never mind that Owens seemed to channel his famous identity as Alberich in Wagner’s “Das Rheingold,” squirming through the water and pawing the pond-maidens. That familiar magisterial voice left no doubt who was in charge. As the jealously seductive foreign princess who turns the prince’s head from Rusalka, mezzo-soprano Ekaterina Gubanova offered a patrician presence in a display of full-bodied, easily arching vocal lines. Horst and Mack had another charming turn when game keeper and kitchen boy visited the lair of Ježibaba, seeking relief for the swooning prince. 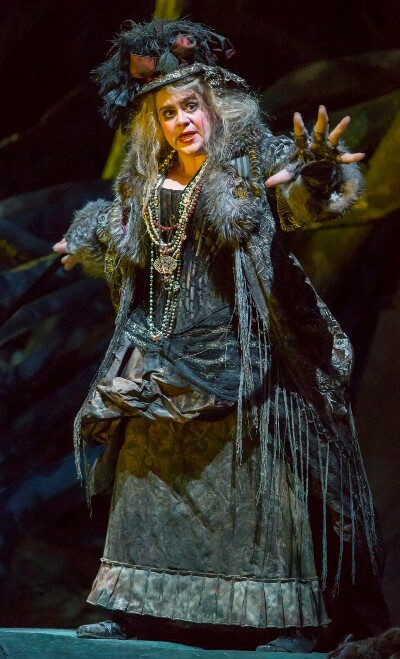 Mezzo-soprano Jill Grove’s comically caustic witch, in grandly ominous voice, was joined by a welcoming committee of three monstrous, anthropomorphic ravens that hopped and flitted and flapped and in vaguely threatening fashion made it clear this was not Kansas. Nor, for that matter, was the local populace of wood nymphs and water sprites an especially genteel lot. Raunchy is what they were, disheveled, romping about in rude games, not at all what you think of as proper spirits. But as choristers, these gamboling and writhing figures were very fine indeed. 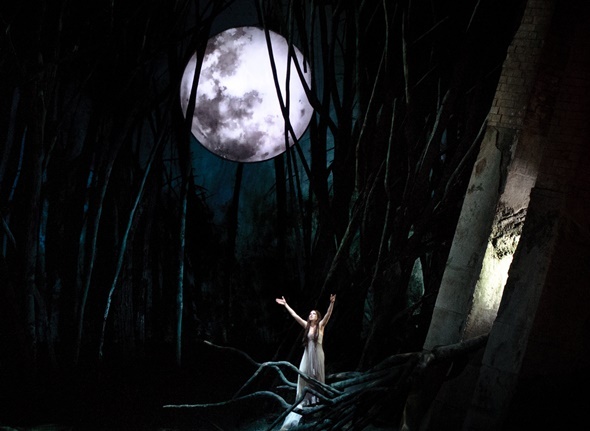 From the heavily wooded lake scene, with its gigantic moon overlooking a towering dam structure, to the palace’s kitchen and grand, glittering ballroom, set designer John Macfarlane has provided the Lyric’s “Rusalka” with visual allure and energy. Much the same might be said of the Lyric Orchestra’s performance under Davis’ dramatically charged and lyrically embracing leadership. The folk-hued dances and laments typical of Dvořák are never far away in “Rusalka,” and Davis’ pit ensemble delivered that evocative music with virtuosity and style. Even as you walk away with this revelation freshly imprinted, the hopeful question occurs: How soon might the Lyric gives us “Rusalka” again?